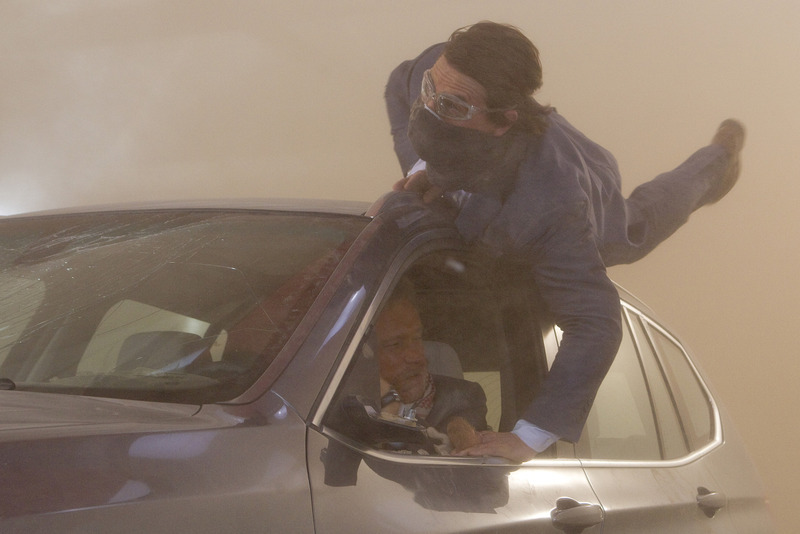 Spookily good – Mission Impossible: Ghost Protocol is full of spirit. Let’s face it, the Mission Impossible franchise shouldn’t have worked. It was released at a time when Hollywood had a yen for taking television series to the silver screen and failing miserably. Most of these big screen adaptations of their small screen counterparts smacked of desperation and unoriginality, of cashing in on nostalgia and an existent fan base. The majority fell on their faces and skulked silently into backwaters of obscurity. Remember The Saint? I rest my case. Not so for Mission: Impossible. Whilst this was essentially just another star vehicle for Tom Cruise, potentially creating a new franchise to compete with the Bond films and turn Mr. Cruise into the American oo7, what they actually delivered was a genuine spy thriller, mixing elements of the sixties cold war films in with the modern action. Cruise was not merely aping James Bond here. He managed to create a resourceful, daring and intuitive agent who, above all, relied on his ability to engender trust in his team to accomplish the mission. Tom proves to Jeremy that he has a bigger Twitter following. The success of the film was probably helped no end by having a first class director in Brian De Palma, a triumvirate of three of the best screenwriters in Hollywood (Steven Zallian, David Koepp and Robert Towne) as well as a first-rate cast. 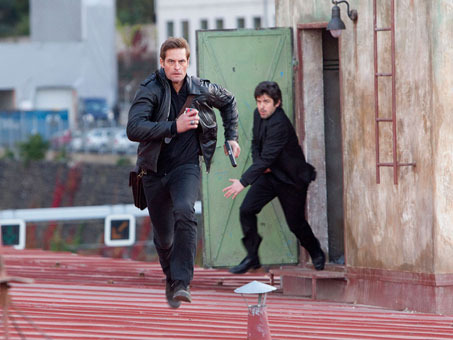 Mission: Impossible attempted to reboot the spy genre, replacing the familiar exotic locations for the dark central European cities, and racking up tension and intrigue rather than the body counts. In short, it attempted what The Bourne Identity resoundingly achieved, only it did it a whole six years earlier. 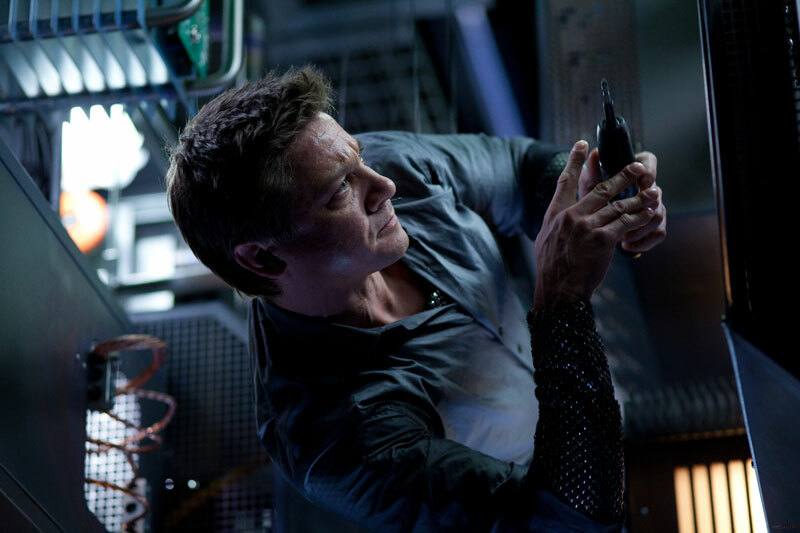 Jeremy Renner finds himself momentarily on the set of Star Trek. Unfortunately, his mobile turns out to be a screwdriver. MI:II was a financially successful film, however, it was not critically well received and has not remained a fan favourite. Comparisons were made to Woo’s other films such as Face/Off, in which many similar themes of duality and identity were explored. Robert Towne himself was told to wrap the narrative around existing action set pieces, which meant the story played second fiddle to the action. Eagle-eyed film fans might notice that Towne borrowed heavily from Hitchcock’s Notorious for the script and the two films are virtually identical at points. Remember, if you’re gonna rip off a script, rip off the best. Despite the poor critical response, Cruise was able to make a third installment, this time wisely turning to J.J Abrams, whose television series Alias and Lost were both extremely successful and popular with the public and critics alike. Abrams succeeded in turning Mission Impossible III into a slick action thriller, applying many of the techniques he’d mastered on Alias to the film. Indeed, at times MI:III felt like a big budget, feature length episode of Alias, which isn’t that far from the truth. Whilst Mission: Impossible dealt with loyalty and betrayal, MI:II dealt with duality and identity, Abrams’ film focused on relationships and trust. Could Ethan Hunt have a genuine relationship with his wife without honesty? Was his relationship more important to him than his responsibilities as an agent? It was this emotional driving force made the film at heart a love story and breathed life back into the franchise. Which brings us to Mission Impossible: Ghost Protocol, the fourth installment to the series and the first to be partially shot in IMAX. At the helm this time is director Brad Bird. 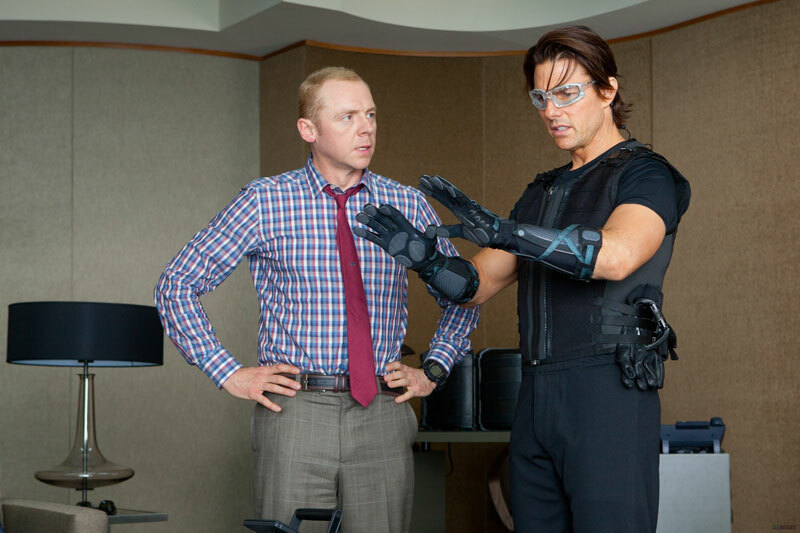 Ghost Protocol is Bird’s first foray into live action film-making, however, with the likes of the fantastic The Incredibles under his belt, he is no stranger to grand scale comic book adventure. Even during an intense chase, Ethan had time for a quick game of Angry Birds. Bird brings with him Michael Giacchino, a long time collaborator with Bird at Pixar, who provided the bombastic score for The Incredibles and delivers a fine score here. Giacchino has also worked on several projects with J.J. Abrams, who, along with Cruise, produces the film. When it came to penning the script, we get another pair of Abrams’ collaborators, this time Andre Nemec and Josh Appelbaum, both previously writers on Alias. You see where this is going, of course? Essentially, bring in people you know and trust and who also happen to be utterly brilliant at what they do. 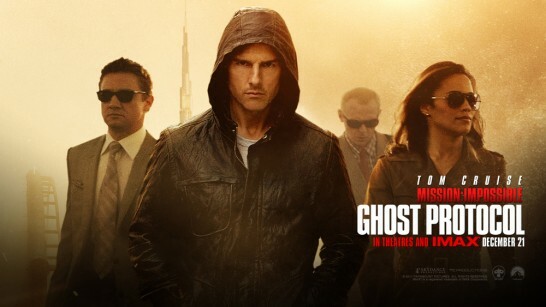 Before anything else, it has to be said that Ghost Protocol is a thoroughly enjoyable film. However, for just a split second, as the camera soars in over the rooftops of Budapest to the strains of Michael Giacchino’s tense, building string score, you might mistakenly think film is supposed to be taken seriously. Fortunately, this notion is swiftly swept away as Josh Holloway’s Agent Hanaway bursts onto the screen and we momentarily blunder into what looks like the most expensive and disastrous Milk Tray advert ever made. Milk Tray delivery boy, Josh Holloway. This just about sets the tone for everything that is to follow. From this point onwards, we are thrust headlong into a litany of ever more incredible and increasingly unbelievable set pieces that stretch our suspension of disbelief well past breaking point. However, the pace is so phenomenally fast that there is simply no time to wonder at the improbability of the events, or the gaping holes in the narrative, as you are picked up and swept along by Ghost Protocol’s tidal wave of absurdity. Never sleep with your boss’ wife in the world’s biggest building. All this may sound like thinly veiled criticism. It’s not. Ghost Protocol might be utterly unbelievable and make very little sense, but it isn’t supposed to. It is there to provide spectacle and to thrill us. Rarely has a film literally had us on the edges of our seats the way this film has. The stunning set piece in Dubai is a case in point. We know that the reason for Tom’s dizzying ascension of the Burj Khalifa is veneer thin, but that doesn’t stop us from literally biting our nails as he scales the glass, 120 or so floors above the ground. We all know that those gloves are ridiculous, but that does not detract for one moment from the tension or suspense. It doesn’t even matter that the most ambitious set piece of the film is used as the mid-point lock-in and actually surpasses the film’s climax. All that matters is that this is Tom Cruise and he’s climbing a really, really tall building. Eek! With all this in mind, it might be easy to look at Ghost Protocol as nothing more than a Brosnan-era Bond, full of ridiculous gadgetry and nonsensical plot devices. However, whilst a film like Die Another Day might have had the absurdly invisible Aston, it also felt tired and Brosnan looked bored, four movies in. The same can’t be said about Ghost Protocol and its star. This film feels virtually electrically charged and Cruise, himself four films in and almost exactly the same age as Brosnan in his last Bond, couldn’t look more energized. What Ghost Protocol has that so many films of this genre lack, is a sense of vigor and, perhaps more importantly, a sense of humour. It straddles the line between serious spy film and genre parody, a feat that, after scaling the Burj Khalifa, should be child’s play for Cruise. Brandt’s revelations turn Benji to drink. Ghost Protocol takes a good look at itself, recognizes its shortcomings and decides to ignore them in favour of style, pacing and a good dose of humour. In most action films you can’t wait for a bit of air, for the down beats and the emotional drama to add a bit of weight to the otherwise rather dry narrative. That’s not really the case here. The moments of calm where a character reveals their motivations or we get a resolution to their arcs generally feel rather flat. You’d be forgiven if, as Jeremy Renner’s conflicted and mysterious Brant reveals the truth about his past, you stole a look at your watch or began drumming your fingers. Not that this isn’t all wonderfully played by the cast. Renner can do this sort of thing in his sleep, and probably is here. Paula Patton, the least known of the cast, strides in with gusto and knocks the ball out of the stadium. Unfortunately, her arc seems to be resolved pretty early and from then on she is reduced to falling back on the rather clichéd role of séductrice. But you can’t help feel that these are characters that don’t really need any extra layers and these are actors that given such flimsy back stories, simply don’t have to try too hard with what they’ve got. Simon Pegg is given really nothing in the way of back story and it doesn’t seem to matter for his character in the slightest. He still manages to steal scenes, even when there’s World’s Biggest Movie Star Tom Cruise and Best Actor Oscar winner Renner in the room. 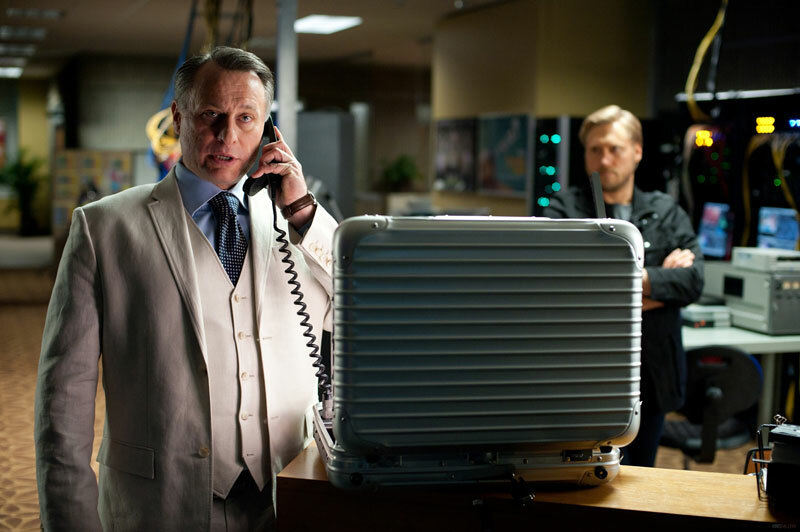 In fact, the only one of the cast that really seems to suffer from being under-written is Michael Nyqvist’s Hendricks, a Swedish but somehow Russian nuclear strategist who spends the film turning up in various locations with a briefcase. Tom accidentally finds himself on the set of Bladerunner. Product placement does start to wear a little as the film goes on. 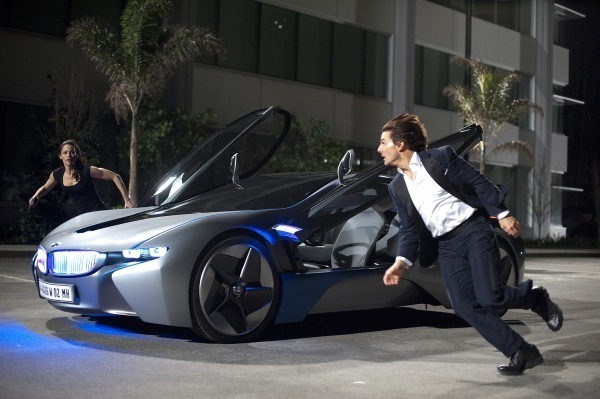 One can only wonder what Apple paid to exclusively supply the IMF teams with equipment and the BMW i8 concept car seems to be unnaturally shoehorned into the script. However, these are just niggles, because as we mentioned before, none of this needs to make any sense. It just has to make us gasp, move quickly and look beautiful and thanks to cinematography from Robert Elswit and editing from Paul Hirsch (the guy that edited Star Wars, for Gods’ sake!) and tight direction from Bird, that’s what we get. It just remains for us to say, look out for some nice cameos and references to the earlier films. In particular, look out for a certain blond henchman. It’s a very small cameo, but fans of the series will know who this is. Oh, and fans of Tom running will not be disappointed, either. 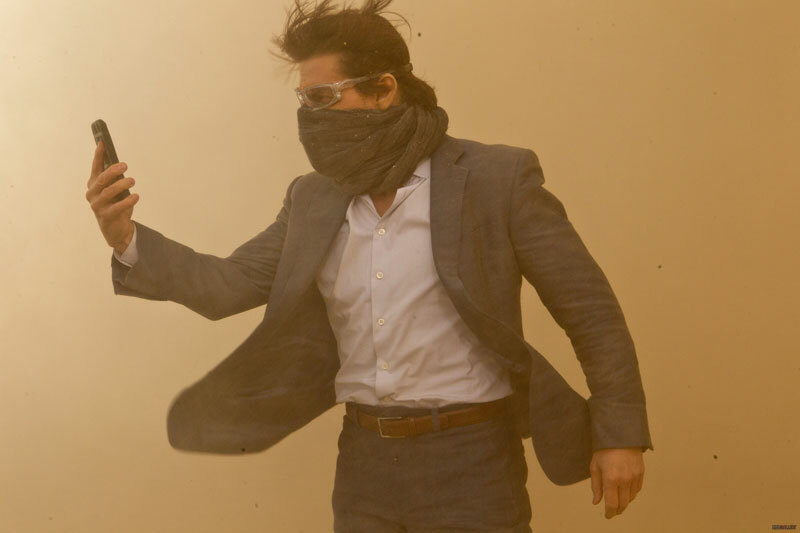 So, overall, Ghost Protocol is a ridiculous piece of confection, but it is also one of the most vigorously enjoyable films to have been released in a long time. It’s not going to change your life, but it might just put a big, fat grin on your face. No wonder Tom’s always smiling. Nice review and assessment of the M:I film series thus far, dublo. 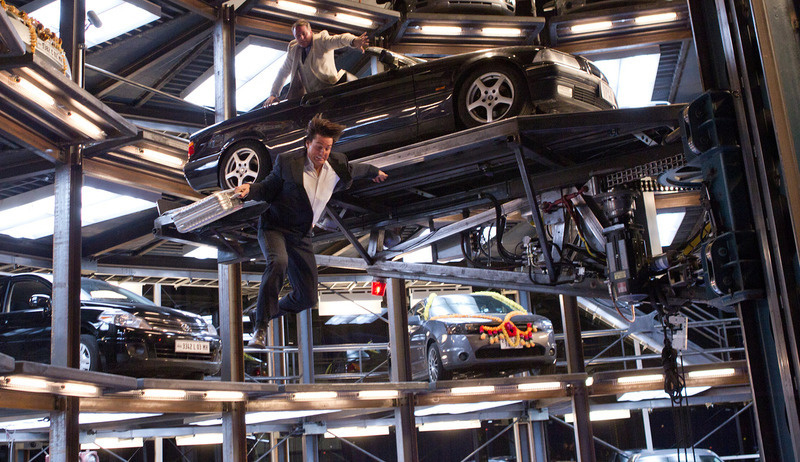 Ghost Protocol is indeed fun, if utterly ridiculous. It did remind me of ’90s Bond films a great deal too – at their liveliest, as you point out. It’s not a patch on GoldenEye for me, though. Thanks, George. I’m glad you liked it. Personally, I think we need these throw away cheesy actioners. They provide a good service to those of us who don’t want to blink for 90 minutes and who like to see if their jaw can hit the floor. I’ve been a fan of the MI films from way back – even before I was in one (had to drop it in sometime.) I hope The Cruiser continues to make silly, but enjoyable films for many years to come. As to Brandt not going mental, that might have just made the film for me. If he’d taken that phone and…well, you get where I’m going.